For dogs that have never been to an agility class. (Mostly on leash work, one dog at a time) Targeting, recalls, send-aways, sit, stay, come, tunnels, tire jump, weave poles, pause table, buja boards, and some jumping. Pre-agility class or instructor approval. Mostly off leash training. Continue with foundation work started in pre-agility class. Start working on handlers and sequencing. Very Low teeter, Small dog walk and A-Frame work. Beginning 1 level class or instructor approval. Most training sequences should be off leash. Teeter at mid-level, start on large dog walk and working on mid-level A-frame. Weave poles are taken down to having just guide wires. Beginning 2 level class or instructor approval. Dogs should be comfortable with all the equipment. Teeter will become full height during the session. All work is off leash. Weave poles need to be able to be done with no guides to graduate from this class. Sequencing to about 9+ obstacles. At this level most students are usually ready to start agility fun matches. Beginning 3A level class or instructor approval. Dogs should be comfortable with all the equipment. Teeter is at full height during this class. All work is off leash and the team needs to demonstrate some ability to work away from their dog. Weave poles need to be performed well at this level in order to graduate from this class. Sequencing about 9+ obstacles. At this level most students are usually ready to start entry level agility trialing. This will be for dogs that have taken at least four beginning classes. The dogs should be able to perform all contact equipment at full height with good quality contact performances. Sequencing will usually be 12+ obstacles. Dogs need to weave well with few issues other than with added distance work. This level class is to work on continually strengthening skill sets and building more confidence and distance ability for the team. In order to move up from this level the team must demonstrate ability to perform courses at this level very well regularly and have added distance skills as well. Dogs at this level are usually competing at the novice to open levels of agility competition. This is for intermediate level dogs that are competing in agility trials. The dogs should be able to perform all contact equipment with excellent quality contact performances. Sequencing will usually be 14+ obstacles. Dogs need to weave well even with some distance. This level class is to work on continually strengthening skill sets and building more confidence and distance ability for the team. In order to move up from this level the team must demonstrate ability to perform courses at this level very well regularly and have mastered many distance skills also. Dogs at this level are usually competing at the open to advanced levels of agility competition. This is for dogs that are competing in the upper levels of Agility. This level concentrates on major distance work and options to utilize those distance skills to achieve better speed and confidence in the team. This level is designed to push the handler and dog in all aspects of agility training. Private lessons can be arranged with different instructors depending on availability of instructors and facility and what the lesson needs to cover. Flat snap type collar for the dog. Preferably one the dog cannot get out of. 4-6' flat cloth or leather lead is suggested. Chain leashes make noise on the equipment and can scare a noise sensitive dog. Nylon leashes can slip easily through an owners hand if the dog pulls hard. Please, no Flexi-leads during class training or choke or pinch collars. A Halti or Gentle leaders can be used while in the isle ways, but not in the class arena. A better option would be a well fitted harness if your dog is a puller. Treats that the dog loves. Stored in a plastic bag in your pocket is not the best. Aprons or Bait bags are better options as we want you to have quick access to your treats without the chance of spilling them. Do NOT feed your dog their full meal prior to coming to class. The treats should be in small pieces so lots of rewarding can be done. Make it something they really love. If your dog cannot eat certain treats and is on a special diet, please let us know before the actual class starts so we don't feed it something it can't tolerate. Please wear comfortable and safe running shoes. Tennis shoes with good tread are fine. If your female dog comes into season during or just before class starts, she will not be allowed to attend any level of agility class. This is a safety rule we find necessary because we cannot allow other dogs to become distracted by a female in season and not pay attention to what we are asking them to do in agility. We will reschedule your classes for the next session if you have to miss more than two classes. The beginning classes are the foundation of agility and if you miss too many important classes it is hard to catch up to the level of the class. Each dog is different so each dog will be evaluated prior to coming back into class after missing some classes. At the beginning of a session we will introduce ourselves and all the students will get a chance to introduce themselves. If you have a dog that is not as sociable as you would like and may have trouble around other dogs, please speak up at this time and let the others know to be more aware while around your dog. Some people can be lackadaisical about watching their dogs when in a group. Not all dogs like to have other dogs sniff them. So please keep a close eye and a fairly short leash on your dog for the safety of the group. The surroundings and the new dogs are all very new and exciting. The first couple of weeks you will see the dogs be very keyed up and more rowdy than normal. When the dogs become accustom to the surroundings and the other dogs, you will find them to quiet down some and start to pay more attention to what you, the handler, are doing. In the Pre-Agility class we instruct on a few basic obedience commands that are important on the agility field. Most homework in the beginning will be to improve these skills if your dog does not have them yet. Sit, stay and come, along with targeting, send-away and enthusiastic recalls will be explained. We will introduce tunnels, the table, weave poles and low jump standards. 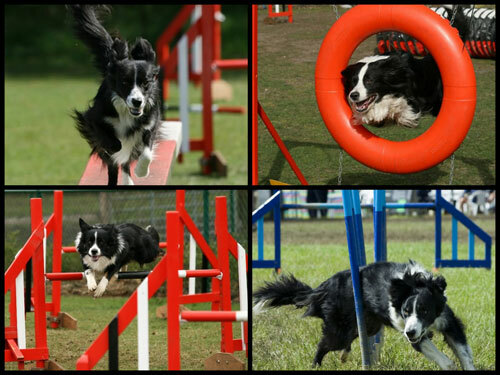 All these things are the basis for good agility dogs and this class is a prerequisite to our Beginning level 1 agility class.